All Alchemy Stones are given a durable clear finish, as part of the decorative process. 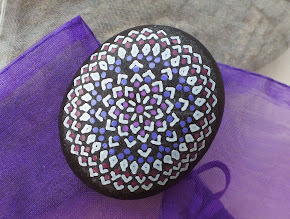 Here's a larger stone I made for the garden. It is about 6" long (15cm, for the metric folks) and has the same finish coat as the smaller stones. As the photo obviously suggests, this is one of our "heart stones." It's named "Path of Hearts" and was made as a Christmas gift for Sarah, this past year. It has been out in the weather for quite a while (since December 2013), and hasn't really suffered any ill effects, as a result. It's being cradled by the small Buddha statue next to our driveway. For the time being, outdoor stones are are in the experimental and testing stage. Although I have little doubt that the stones will be fine if left outside, I'm not willing to release them to the world as "suitable to leave outside" until they've been through at least a full year of every conceivable type of weather conditions. It is, however, an idea we're planning to develop further. Originally, the question of "leaving Alchemy Stones outside" came about because we decided the "petite stones" were perfect as small gifts or "offerings" for people to leave at the centers of labyrinths they were visiting. Of course, most labyrinths are outside, and we wanted to make sure the stones would hold up to the elements. Maybe the idea of "road testing" items that are basically art or metaphysical altar objects sounds a bit strange. I chalk that up to my Danish heritage... in Danish culture, the idea of "form" and "function" being closely tied is extremely important, and I was raised with the idea of "functional art." Everyday objects were expected to not only be beautiful (or, at least, aesthetically pleasing) but also to have excellent functionality. Hence the idea of having Alchemy Stones that look pretty but lose their decoration after a few months just rubs me the wrong way. And so, the "road testing" project continues.